B.C. Home » FLNRO » Fish and Wildlife » Wildlife » Hunting in B.C. The 2014-2016 Hunting and Trapping Regulations Synopsis is effective from July 1, 2014 to June 30, 2016. The Hunting and Trapping Synopsis is a summary of the B.C. hunting and trapping regulations made under the Wildlife Act (British Columbia), prepared for the convenience of hunters and trappers. The Hunting and Trapping Synopsis sets out general hunting information, summarizes important hunting regulations, and defines the open seasons with maps indicating no hunting, no shooting, and other closed areas. 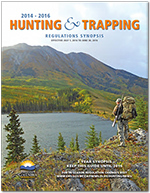 The 2014-2016 edition of the Hunting and Trapping Regulations Synopsis covers two seasons effective July 1, 2014 to June 30, 2016: it will be your guide to hunting and trapping for the 2014/15 and 2015/16 seasons. In the event that there is a need to change a regulation in 2014/15 or 2015/16, the online version will be updated with any changes highlighted in red and listed in a corrections poster. Sign Up for Instant Updates of In-Season Regulation Changes! Visit our RSS Feeds page to subscribe to receive instant notifications of in-season regulation changes, and to see a complete list of RSS feeds that we offer. and retail outlets where hunting licences are sold.